The signature capture feature of FileMaker Go allows one-step signature capture integration into FileMaker apps deployed on iOS devices using Container fields. 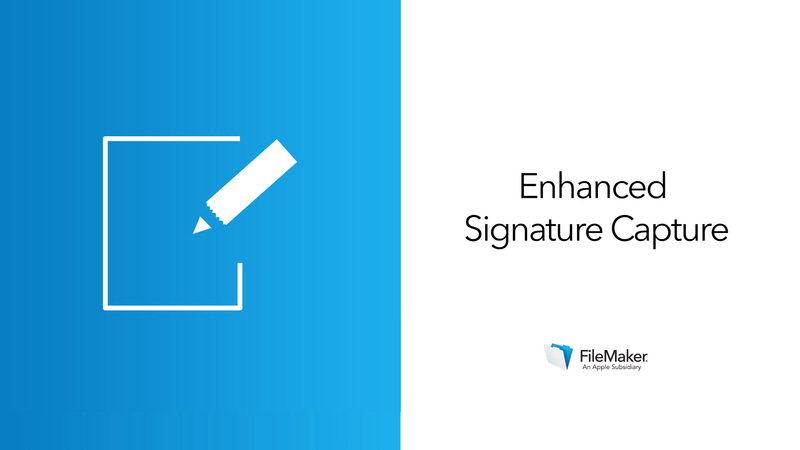 Previously, the signature capture window appeared in full screen only, but now in FileMaker Go 16 you have the additional option to capture signatures capture directly into the container field on the layout ("Embedded") or into a floating modal window (“Overlay”). Developers can specify these options with a single parameter in the Insert From Device: Signature script step. This means you can customize the signature pages of your app so users sign documents on the iPad or iPhone just as they would on a paper form. Your users will now be able to see the form they are signing right on the screen while they add their signature. The new formats also have intelligent resizing. If the layout space does not have enough room to display the text in the capture window, FileMaker Go will use available space for the essential signature capture while hiding or truncating text. When a client can see both the document and the signature area at once, the signing process becomes easier for both the business and the client: the business user can hand an iPad to a client with less explanation, and the client will rest easier knowing their signature is being applied directly to the document in question. Explore the new Overlay and Embedded signature capture options in action.